1. Although sloths do not have much muscle mass, they can hang from trees with their claws. Sloths have been known to die while still clinging on to a tree limb and they are still grasping it. 2. Sloths will sleep as much as 20 hours a day, but they generally only sleep about half that amount. They sleep curled up next to a tree branch or while they are hanging from a tree limb. 3. In some cases, it can take a sloth an entire month to digest a meal. They have four stomachs that are used to digest the tough leaves and branches that are a normal part of their diet. 4. Sloths can mate while hanging from tree branches. 5. Sloths only leave their trees about once a week, mainly so they can urinate or defecate. They will dig a hole so they can cover their waste when they are done. They then go back to their trees. 6. 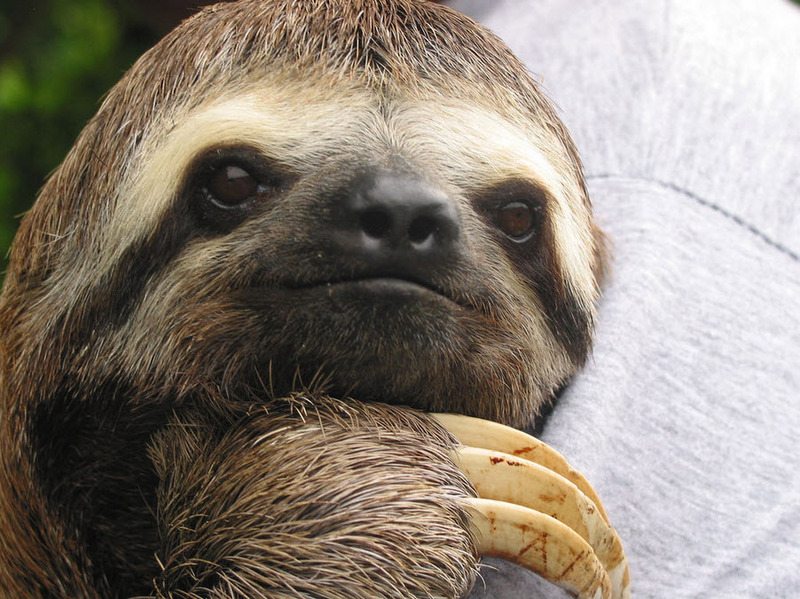 There are currently six species of sloth that are known to researchers. These species are typically broken up into two categories – the three-toed sloths and the two-toed sloths. 7. The sloth is technically a folivore, which is an herbivore that mostly eats leaves as their primary food source. 8. Due to an extra vertebrae in their neck, sloths can turn their head about 270 degrees. 9. The sloth is such a sedentary animal that algae often grows on their backs. This is helpful, though, as a form of camouflage for them. 10. Although they live such a sedentary lifestyle, sloths do not get very overweight. Instead, they store extra fat on the underside of their feet. 12. The main predators of sloths are eagles, jaguars, and snakes. However, since they blend in well with the trees, they are practically unrecognizable to most predators. 13. Because leaves are not very nutritious, sloths do not get much nutrition, leaving them with very little energy. As a result, they typically move slowly so they can conserve the energy that they have. 14. Due to humans encroaching on their habitat, the three-toed sloth is becoming extinct. 15. In the wild, sloths can live as long as 20 years. In captivity, they have been known to live to be 40 years old in some cases. 16. Sloths are mainly found in Central and South America. 17. The only defense that a sloth has against predators is its claws. 18. Sloths do not prefer to spend time with other sloths. They only time they like spending time with each other is when they are mating. 19. A female sloth only gives birth to one offspring each year. 20. Although sloths look like they belong in the monkey family, they are actually related to anteaters and armadillos more so than monkeys. 21. Sloths can grow to be between 2 and 2.5 feet high. Their weight can range from 8 to 17 pounds, depending on the species. 22. Another thing about the three-toed sloth is that they have markings on their face that make it look like they are constantly smiling. 23. The only three-toed sloth found in captivity in the United States is at the Dallas World Aquarium. They three-toed sloth has a very particular diet consisting mainly of Cecropia trees, making them very hard to take care of. However, the two-toed sloth, with a less particular diet, can be found in many zoos across the United States and other parts of the world. 24. Sloths are relatively good swimmers. They have fur that helps them pass through the waters quickly and efficiently. 25. On average, a sloth only moves about 13 feet per minute.